You probably don't give them much thought, but every day worms are crawling through the ground beneath your feet, aerating the soil and processing the organic matter found there into nutrients plants can use. It's not a glamorous job, but it's an important one that leads richer soil, lusher landscape plants and healthier food crops. If you want to benefit even more from the worm's humble work, you can start your own composting bin in your yard and fill it with red worms who will go to work for you. Before you do, though, it's important to understand the red worm's habitat so you can keep your worms healthy and happy. If you're a cat person, you probably just see a generic dog when looking at a friendly canine. True dog lovers, however, understand and care about the distinctions between the many different dog breeds. Worm aficionados feel the same way. There are many different breeds of worm, and it matters which breed you get. Red worms (Eisenia foctida), also called red wigglers and tiger worms, are a specific breed that works well in compost bins. Red worms are often confused with earthworms (Lumbricus terrestris), however, even though the two species are very different. 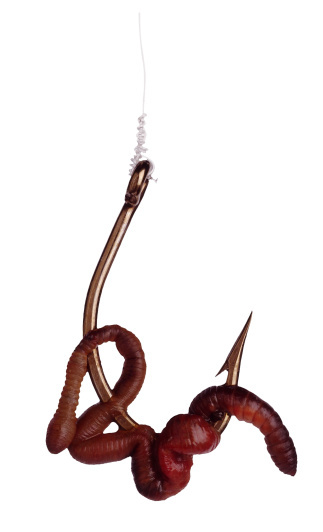 Earthworms, also called night crawlers, make excellent fishing bait but terrible composters. Make sure you get the right worms when starting your worm farm. Found in the top 6 inches of soil, red wiggles congregate in dark areas full of organic matter. Decaying materials, such as dead leaves, aged animal manure and garden waste, all serve as food for the species. 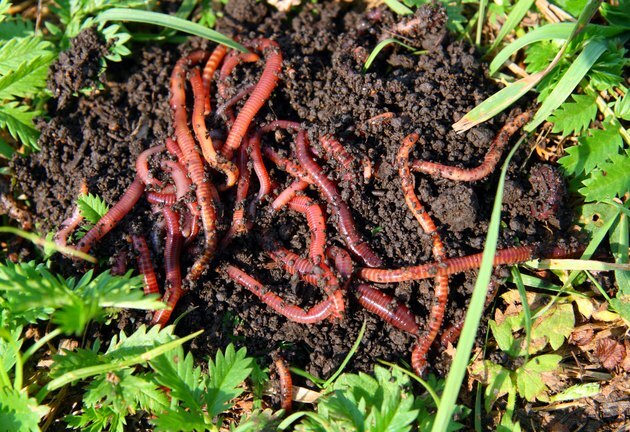 Unlike earthworms, red worms eat the decaying matter in the soil. Earthworms, on the other hand, actually eat the soil itself. Because they clump together in large, wiggly masses where food is abundant, the worms live in close proximity to each other. This makes for easy breeding, and healthy worms can double their population in three months. Red worms like temperatures between 45 and 80 degrees Fahrenheit. They will seek out cooler areas when the weather turns warm and usually die when the weather turns cold. Red worms drop egg cocoons that can survive harsher conditions than the worms themselves. When the weather warms again, these cocoons hatch and the young red worms keep the species going strong. Because they eat their own body weight every two days, red worms make excellent compost helpers in the home garden. If you start with 1 pound of red worms in your compost bin, your worm colony will have the ability in six months to process four pounds of organic matter every two to three days. When composting with red worms, you can add vegetable waste, fruit waste, coffee grounds, eggshells, garden waste, tree leaves, cardboard and aged manure to your compost bin. Avoid meat scraps, pet waste, human waste, citrus fruits, cooking oil and dairy products. Some of these materials will kill your worms and others you simply don't want to be spreading on your garden later. Limit the amount of salt in your compost waste, as well. To get started on your worm composting journey, buy a plastic compost bin or build a wooden one. If you're using a wooden bin, line it with plastic. Place the compost bin in a shady area where your red worms won't get too hot. Place some organic waste in the bottom of the bin and sprinkle a handful of soil on top of it. Then, tear up about 50 sheets of newspaper into small strips and wet them until they are damp but not soggy. Place this newspaper bedding into the bin on top of the waste and soil. Fill the bin until it is about three-quarters of the way full, making sure the newspaper bedding is fluffy and not packed down tightly. After preparing the bin, simply add your worms. A 24-inch by 24-inch bin can house more than 1,000 worms, so you buy a pound of red worms and not worry about overcrowding. Feed your worms and fluff their newspaper bedding at least once a week. Spray the bin's contents with water if the newspaper gets dry and add more paper if it gets too soggy. Leave your bin lid slightly ajar, as well, so the compost bin gets proper circulation and ventilation. In the winter months, feed your worms less and bring your bin inside to a garage or basement to keep the worms warm. If you leave your bin outside, make sure your worms have lots of bedding to keep them warm.